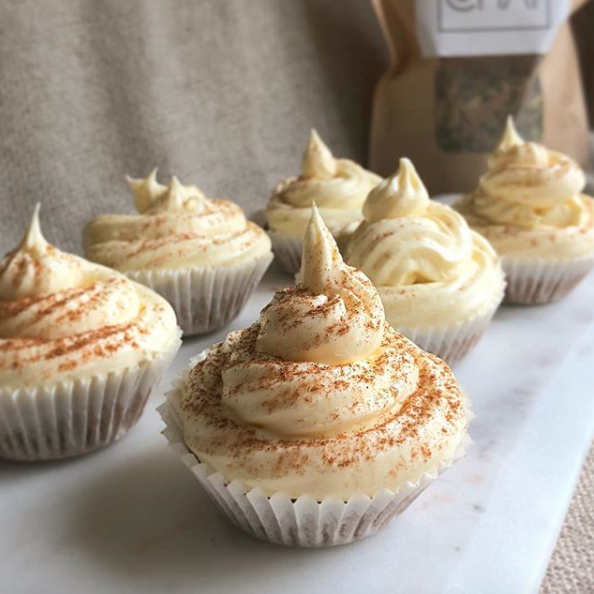 As I’m writing this the weather has taken a slightly gloomy turn and little grey clouds are drifting past my window – perfect weather for cupcakes! It’s been so lovely and hot recently that I admit I’m glad of a little rain. It’s also an excuse to bake (and eat) lots of delicious cakes and cookies! Vanilla chai cupcakes have become a modern classic. This version is made with our Aura Chai original blend – for a truly delicious and authentic flavour. Not only that – this recipe makes a healthy, wholesome treat – using wholewheat flour and no refined sugar. I am gluten intolerant so I used low-gluten Spelt flour, but if you’re allergic to gluten you can also use regular gluten-free flour! 1/ Pre-heat your oven to 180 degrees and line a baking tin with cupcakes cases. 2/ Start by adding the almond milk and Aura Chai blend to a milk pan. Simmer on a low heat (without boiling) for around ten minutes. The milk should turn a deep brown colour and will smell delicious once it’s ready! 3/ Meanwhile combine the oil, vanilla extract, Xylitol and maple syrup with your flax eggs. 4/ Sieve in the flour and baking powder and mix carefully until combined. 5/ By now your chai milk should have been simmering nicely. Take it off the boil and leave it to sit for 10 mins before using. 6/ Gradually add in the chai milk mix, mixing as you go. Leave around 2 tbsp behind – we’ll use this for the frosting later. 7/ Spoon the batter into your cupcakes cases – until they’re around 3/4 full. Bake for 15-18 minutes until risen and golden brown on top. 8/ Leave the cupcakes to cool. 9/ Now it’s time to make the icing! Mix together the butter and Xylitol then add in the vanilla, cinnamon and remaining chai milk mixture. 10/Pop it in a piping bag and make pretty patterns then dust with a sprinkling of extra cinnamon. Voila! What are the health benefits of green cardamom?